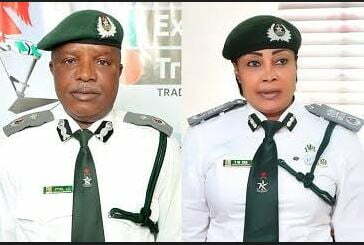 The management of the Nigeria Customs Service (NCS) has approved an additional uniform to officials of the organization. NCS said the new uniform will give officers and men variety of uniforms, depending on the weather and assignment to be executed. The additional uniform, which was officially unveiled to the public by the acting deputy comptroller-general of Customs in charge of Tariff and Trade, Isa Talatu Mairo and the Service Public Relations Officer, DC Joseph Attah, has white atop the usual ash coloured trouser with a tie to match. The NCS said officers and men working in offices, airport and especially during hot weather will find it easy and more comfortable to wear the uniform on duty. ‘‘For the avoidance of doubt, this is not a change of uniform but an addition to give officers and men variety of official wears,” he cautioned.